A stainless steel hipflask with a smooth modern design and tethered cap. Funnel included for easy filling. 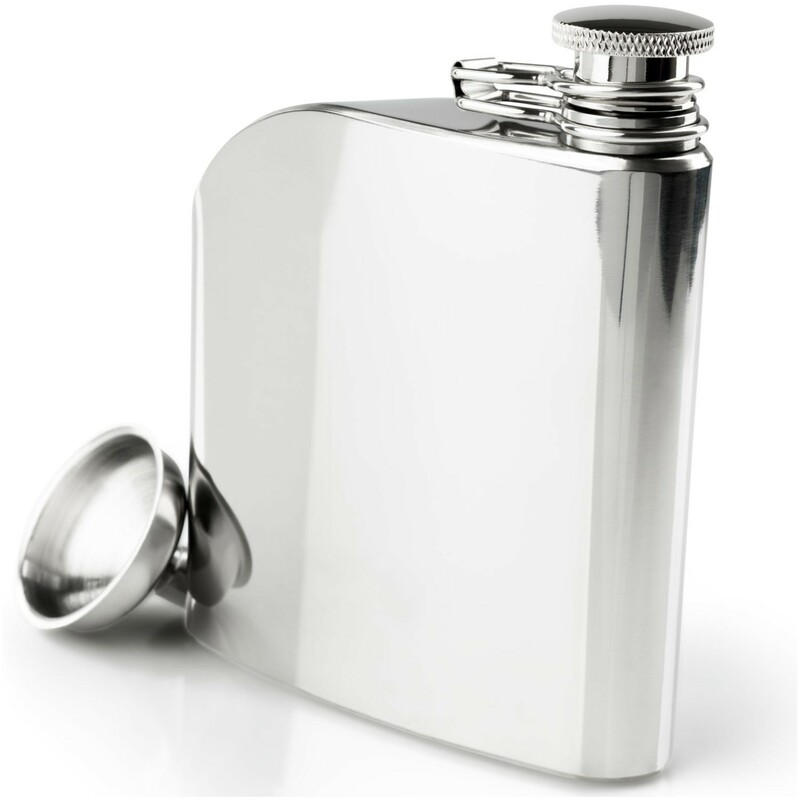 A stainless steel hip flask with a smooth modern design and tethered cap. Funnel included for easy filling. We try to keep the site updated with products that are in stock and despatch within 1-2 working days (Mon-Fri). Occasionally items ordered may be out of stock. If this should happen we will contact you to let you know when we will be able to despatch your order. Please note that all deliveries are made between 08.00 and 18.00 Monday to Friday and may require a signature. Orders are typically despatched with Royal Mail Tracked 48. Please note that this is a guideline only as a different delivery method may be used depending on the size/weight of your order – if you would like any more information on your delivery please contact us. Orders placed BEFORE 2pm Mon-Fri will be despatched the same day, usually with Parcelforce (requiring a signature). Any Next Day orders received after this time will be despatched the following working day. Please note any orders placed AFTER 2 PM on Thursdays will be despatched on Friday, but not delivered until the following week. Next Day isn't possible on Bank Holidays. If you have a mobile number on your account you will receive SMS notifications regarding delivery (UK mainland deliveries only). We regret to say that we are unable to change the address or postcode on a parcel once it has been despatched. We therefore recommend that you check your delivery address and postcode carefully before completing the order as this will not be checked by us before despatch. We also recommend that orders are sent to an address where someone will be available all day to receive the parcel, e.g. a work address. Orders weighing 2kgs and under, going to European countries will cost £9.95. Orders weighing 2kgs and under, going to other international destinations will cost £11.95. Orders over 2kgs or bulky orders may be more expensive to post - we will contact you before we process your order if this is the case. The majority of our International orders are sent with Royal Mail's International Signed or Tracked services, which will then be passed to the postal service of your country for onward delivery. We are happy to deliver most items to BFPO addresses. If your location means that your purchase is VAT-exempt, we are happy to deduct the VAT from your order before shipping. Please make sure that you include your BFPO number in the Postcode field on your order so we can verify the VAT-exemption. Your barracks or PO Box no. Delivery is free to BFPO addresses, however we may be unable to ship certain items due to their size, weight or value. We will contact you if this is the case. If you have any problems or queries, please contact us.